First preview version available. This version is tested for launch and orbital maneuvering only - no work on entry and aerodynamics of the orbiter yet, what you get if you try is completely random. Use --aircraft= SpaceShuttle-launch for the stack to be placed vertical and ready for launch, --aircraft=SpaceShuttle-orbit to start right after MECO on the ascending leg of an orbit, --aircraft=SpaceShuttle only if you know what parameters you need to pass. Do not use --auto-coordination or you will die! Ignition of the main engines is done via throttle - SSME 1 to 3 ignite as soon as the throttle reaches 65%. This is not enough to achieve liftoff for the normal launch mass of the shutte, however main engine ignition triggers SRB ignition three seconds later. 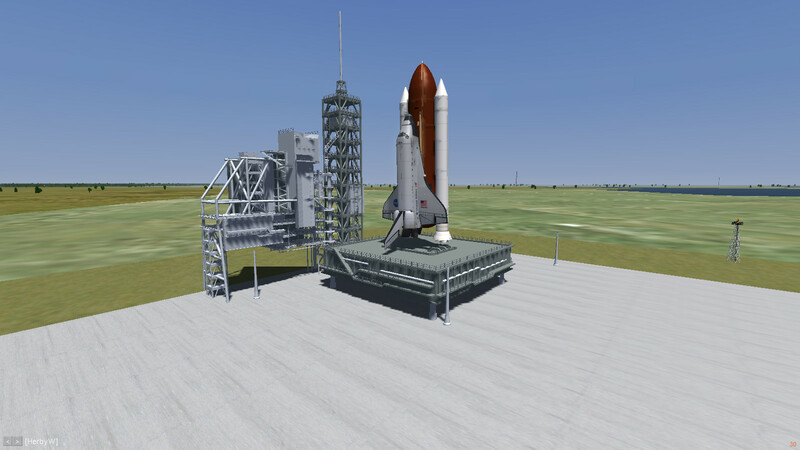 Once both SRBs ignite, the shuttle will lift off the pad rapidly. Upon ascent, the shuttle is controlled via thrust vectoring of both SSME and SRB. Initially, with the strong SRB thrusters far from the CoG, the launch stack is very maneuverable - don't get used to it. Once clearing the pad, rotate to the desired launch course, then pull the launch stack gently out of the vertical to an about 70 degree inverted climb (the ride into orbit is done head down...). The external tank is very top-heavy (most of its mass is in the oxygen tank on its top) - take care that the stack doesn't topple too far out of the vertical, or you will never recover. Initially aerodynamical forces on the orbiter will require sizable thrust vectoring, as you clear the atmosphere the need will gradually go away as the flight control systems automatically vector each engine through the CoG. SRB thrust can not be throttled, however the main engine can, and you will see a callout to throttle back the main engine to 65% after 34 seconds to avoid the highest dynamical pressure during ascent to damage the vehicle (damage is currently not modeled). SRBs will burn about 128 seconds before they are disconnected. At this point you should be on your launch course, out of the atmosphere at around 200.000 ft and still on a 70 degree climb. Once the SRBs connect, most of your thrust will be gone and since the main engines are very close to the central axis, thrust vectoring efficiency will be dramatically reduced. In addition, you are now in vacuum, so any yaw, pitch or roll motion will continue indefinitely till it is countered by opposite thrust. The most important thing is to stay on your launch course - if you get a strong yaw drift, you will never make orbit. Roll the orbiter out of inverted position, decrease climbing angle to 30-40 degrees and try to hold launch course and climb. Watch vertical speed and altitude - pull up once vertical speed starts to reduce to zero to maintain current altitude, don't worry if you start dropping for a minute, if you manage to reach orbital speed it won't matter. Try to level off at about 650.000 ft. If you managed to control launch course and climb, after a few minutes, velocity over ground should climb to 7 km/s. As the tank empties, thrust gets more powerful again, watch g-forces and throttle back as needed to keep the load below 3 g. Eventually you should see the periapsis coming up above zero, meaning that you are about to reach orbit (there'll be another callout). Timing is critical, watch the apoapsis till it reaches the orbital altitude you want to reach, then cut thrust fast and drop the external tank. Controls now switch to the reaction control system (RCS). Best use the keys to fire thrusters, 5 to cut thrust. Watch yaw, pitch and roll rates in the HUD. Do not leave controls uncentered at any point after maneuvering, not even a bit, you will regret it! Your apoapsis should be where you want to go (say 650 km), your periapsis about where you are (say 240 km). Use the RCS to align the shuttle with the flightpath ('prograde orientation'). Wait till your altitude rises to the apoapsis, then lower the nose about 15 degrees below the flightpath (the OMS thrusters are located fairly high at the rear fuselage, so to align thrust through the CoG with the flightpath, the nose needs to be down) and use thrust control to ignite the OMS engines for a few minutes ('prograde burn'). Watch the periapsis value climb till it reaches the apoapsis value - congratulations, you've reached a circular orbit. Last edited by Thorsten on Mon Apr 06, 2015 6:31 am, edited 5 times in total. I hardly believe my eyes this shots are FG! Thorsten wrote in Sat Mar 21, 2015 6:16 pm: Now what's missing next is that the Space Shuttle isn't flown by aerodynamical controls during ascent. Needs to be implemented. You guys know about Jon Berndts excellent shuttle FDM right? Last edited by erik on Sat Mar 21, 2015 9:26 pm, edited 1 time in total. Can we have download links for the space program aircraft? I do - the space program people do not apparently. Jon has the glider and there's an example of the SRB in the JSBSim manual, but last time I asked, he didn't have the whole launch assembly. True, but I know he has done some extensive performance testing on it. And it includes de complete(?) flight computer (which isn't all that sophisticated after all). Re-reading some - to avoid misunderstandings: I'm not actually the author of the space program - I've just tested the shuttle which is supposed to be its workhorse. Anyway, I invested some time into rigging something that has the correct thrust figures for the main engine and the SRB's, has the tanks placed at roughly the right position, starts balanced upon its tail, has balanced thrust on liftoff and is capable of thrust vectoring with the real angular ranges on ascent. It's *very* shaky and difficult to control without some automatic guidance, but it can be flown to orbit manually on a realistic flightpath. I'm not even remotely there... need to care for a more stable ascent,... but I guess eventually the orbiter needs to be replaced by Jons - given what I have seen from the 'official' one here for the launch stack, the orbiter is probably a similarly butchered job,..
Thorsten: 1.First of all, this is not a plane, it is a rocket. 5. Now what's missing next is that the Space Shuttle isn't flown by aerodynamical controls during ascent. Needs to be implemented. 7. I do - the space program people do not apparently. 8. he didn't have the whole launch assembly. 9. It's *very* shaky and difficult to control without some automatic guidance, but it can be flown to orbit manually on a realistic flightpath. 2. The FDM is well developed and makes what it should make, including orbit manouvers. 3. It took me 1 minute to set 0 to 90 degree at the model. 4. The engines are set as they are in the original shuttle from the nasa. 5. Again, the FDM is far enough developed that you can make any mission you want. 6. And again, the FDM is very well working in the FG space up to 780000 ft, and if you try it out up to 100000000 ft.
7. We do, but we do not use something what is not working, now the shuttle is working fully, befor it was not working at all. 8. We have the launcher, and we are working on it to get it running. 9. The shuttle is not build to fly like an aircraft, it allways needs the help of automatic controls. 10. Ok, replace it and have fun with it. We take ours and have fun too. and many test pilots. Have fun! Last edited by HerbyW on Mon Mar 23, 2015 7:39 pm, edited 3 times in total. See, I happen to be very interested in spaceflight. I've taken the time to learn the Orbiter shuttle and flown a complete mission over the course of a few days, I've done lots of time on the Vostok of FG, I've spent time to write decent orbital visuals for FG. I actually care about this stuff. A lot. It's completely okay if you want to have some fun, but then simply say so and don't claim it's realistic. That's what I start having problems with. Or, to quote from your own description in the help text: Give throttle, and take off, be carefull with throttle - it is a rocket! What's it going to be, space cowboy? That's a really strange statement. Your SRB definition comes with an ISP of 1600 s (!) - that's better than any cryogenic fuels can deliver. The real thing has 268 s - you're only a factor six off... You have a fuel flow of 1940 lb/s for two SRBs taken together - the real thing has about 10.000 lb/s per booster (so you're only a factor ten off...) - which sort of compensates, except you don't have the thrust to launch the real mass, so you initialize with tanks mostly empty to get a liftoff at all. The real SSME is mounted tilted in pitch by 17 degrees - yours is not tilted at all. Your engine is mounted 200 inch behind the orbiter's CoG - that's definitely not where the real thing is, it's way at the rear of the spacecraft. Should I go on? The engines are absolutely not as they are in the original shuttle. Fantastic. So why do your instructions for launch for the vertically turned version read: Do not try to start up! Sounds a strange statement for an FDM that is well developed and makes what it should make. I don't think you have solved the problem unless it actually launches. Which it won't unless you get thrusters right and get the mass balance realistic. 6. And again, the FDM is very well working in the FG space up to 780000 ft, and if you try it out up to 100000000 ft.(...) 5. Again, the FDM is far enough developed that you can make any mission you want. Surely not - since I have no thrust vectoring but have to rely on aerodynamical control surfaces (!) upon ascent, I fail to see how I could possibly do a TAL (Transoceanic Abort Landing) much less a RTLS (return to launch site) abort. The OMS might allow you to control attitude above 250.000 ft, but not flightpath - which is kinda crucial if you want to fly any of the launch abort scenarios or insert into a specific orbit rather than go up randomly. You might not like the news, but yeah - I have been a test pilot as well. I've flown your original version - and it can't do a real ascent path. End of story as far as realism goes. I'm sorry, but you butchered this. You might have rigged something that goes into space and that can be attitude stabilized once up, but its dynamics and capabilities don't resemble a real spacecraft, much less the shuttle.